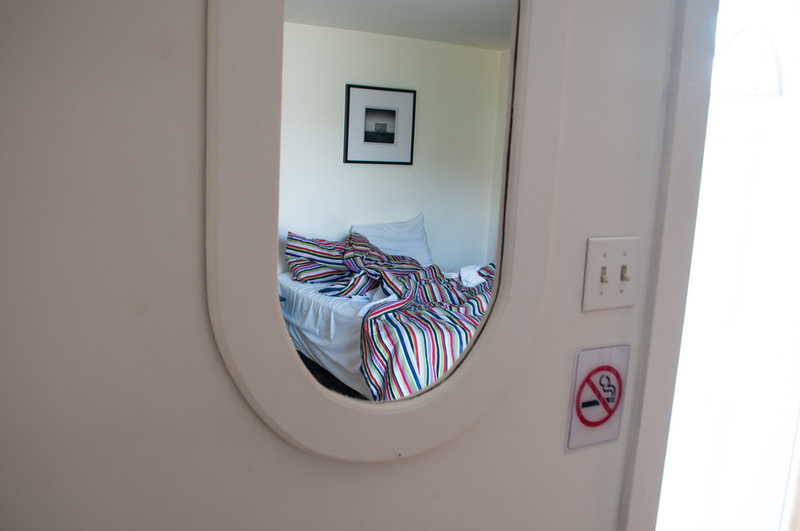 ​Over the course of several stays at the Christiana Motel, conceptual artist and photographer Maria Möller explored what is left behind after check-out in the intimate but transitory space of a motel room. At Street Road, a 20 minute drive from the motel, 24 Hour Liminal imprints the gallery space with these images of anonymous but repetitively-inhabited rooms, reflecting on the narrowly bordered intersections of privacy, intimacy, security, transit, and home. Placed amidst these images, a bed and nightstand recreates the Christiana Motel at Street Road: each weekend during the exhibition, a single guest will be invited to stay. Their subsequent reflections on this experience of public solitude will be layered onto the exhibition incrementally. Far to Go, a companion piece at the Christiana Motel, displays snapshots of rooms where Möller has stayed while travelling, taken over the past 15 years. One snapshot, accompanied by a short travel narrative, will be displayed in each room of the motel, with the complete series available as a limited edition brochure at the motel’s front desk. exchanges ideas and knowledge, art and objects between the ​citizens of Philadelphia and Medellín, Colombia.